It’s not an official release. The icons are currently not good enough. They are mostly various things I’ve borrowed temporarily from various websites or drawn myself, until I get a pro to design them for me. But if you want to try out Poker Copilot with the player icons, you can get download a sneak preview here. 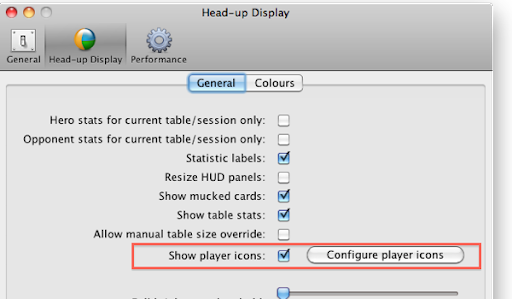 To customise the rules, go to the Poker Copilot Preferences, choose the “Head-up Display” panel, and click on “Configure player icons”. ﻿The vast majority of online poker players, I’m sure, play for fun at small stakes, and spend no more in a losing session than they would in a night out at the movies or in a bar. For some, however, poker becomes much worse than that. Hit a set of 6s on a J-6-2 rainbow flop against the Donkey at the table, the one who is wearing a fake Versace rayon shirt whose outrageous patterning is the only thing taking attention away from his Dolce & Gabbana sunglasses and the poor, doting, usually underage girlfriend who sits behind his right shoulder, awash in the illusion that her boyfriend is Paul Newman from The Hustler—well, win $5,000 off a guy like that and you stop worrying about ethics and your misspent youth. That’s from an excellent essay-length memoir of a gambling addict. Problem gambling, in my opinion, doesn’t get enough attention in the online gambling world. Except in France, where all online poker rooms are required to prominently promote a free-call hotline for problem gamblers. The stripper lowered her glasses to the tip of her nose and stared at me with sympathetic eyes. She muttered, “Baby, it’s a bad time to hit the second best full house…” and pushed the rest of her money into the middle. The table gasped in delight. She flipped over her two kings. My tens full of kings were beat by her kings full of tens. I have no idea what the last card was, just that it wasn’t the case ten, the only card in the deck that would’ve won me the hand. The fantastic stripper apologized and apologized again as she stacked up my $9,000. I couldn’t face her sincerity, so I got up from the table and wandered off to the sports book, where I dropped myself down on a club chair and wondered aloud what exactly had happened. I think more countries should follow France’s lead and regulate online poker. Make it 100% explicitly legal but require strict player identification methods, make it possible to ban those with problems, and promote ways to quit. In France you can request a voluntary, non-reversible self-ban from all French casinos, online and otherwise for a period of three years. [People] bring up our recent growth spurt, and they ask what our “silver bullet” was. Most think it was the introduction of our freemium plan, but that’s not the case. I don’t think there is a silver bullet anymore (I say this, after chasing it for about a decade). I think you just have to work hard for about 10 years before you know what you’re doing. Success is too often portrayed as easily achieved by a genius. “He did X, Y, and Z, and now he’s super-successful!” But in my opinion success usually comes as a result of working hard for a long time, learning from mistakes, continuing to study in your field, and seizing upon lucky breaks. With emphasis on the lucky breaks. There are counter-examples, but these are anomalies. In my case, success with Poker Copilot came after almost a decade of trying to create and launch a software product. Along the way I made plenty of mistakes. Thankfully I learnt a lot from those mistakes. It’s pretty cool watching the various icons appear next to each player. In the screenshot the icon you see is a place-holder icon until I get some real icons. It is 16×16 – hopefully I can keep them this small but I may need to go to 32×32 to allow more detail. There is a new HUD preference that allows you to turn on/off the player icons. It defaults to on. The rules for what icons to use are currently hard-coded. I hope to create a “rules editor” in the next day or two, based on the mockups I showed yesterday. 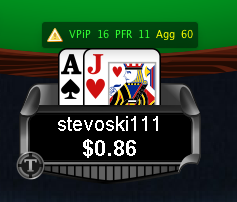 I hope to add player icons to the next update of Poker Copilot. A set of rules will decide whether a player is a rock, a fish, a whale, an eagle, a calling station, etc. The icon will be available to show in the HUD and the “Player Summary”. There will be default rules. You can edit the rules, either for all tables, or for specific table types and sizes, such as “No Limit Hold’em 6-max”. The icons in this mockup are placeholders – they will of course actually look like rocks, fish, etc. Best program I’ve ever owned. Thanks for all the killer updates. It’s because of guys like you that I was Check-raising Chris Moneymaker at the NAPT LA last night! I think I would be very nervous check-raising Chris Moneymaker. Or calling. Or raising. I could probably just about manage a fold. Of all the well-known poker pros, he is the one who I would least like to play. Due to his demeanour. ﻿﻿Poker Copilot 2.69 is now available to download. PokerStars tournament summaries now auto-added. Read how to enable this in PokerStars. 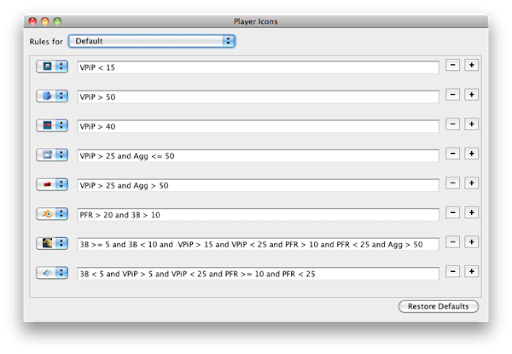 Tournament summary files for Full Tilt Poker.FR (France) handled correctly after change introduced in recent Full Tilt Poker update. Poker Copilot people: ignore this post. I’m just seeking Google goodness for a side project I’m doing while in Beirut: English Speaking Beirut. Move on now, nothing more to see! I aim to learn the computer language Python while in Beirut for the winter. What Mac OS X Python IDE do you recommend? I am using the new IDE called PyCharm which I like because it works almost exactly like IntelliJ IDEA, my favourite Java IDE. But I want to make sure this is as good as it gets. What book or resource do you recommend for learning? I’m using the free Python tutorial. Which is okay but I prefer dead trees for this type of thing.